Things must have been very different back then. Outstanding mate! There's nothing that ROKC sleuths cannot uncover! 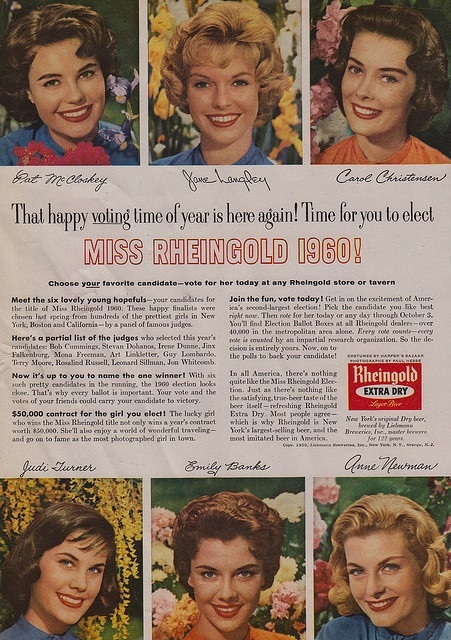 At the center of its media campaign was the "Miss Rheingold" pageant. Beer drinkers voted each year on the young lady who would be featured as Miss Rheingold in advertisements. In the 1940s and 1950s in New York, "the selection of Miss Rheingold was as highly anticipated as the race for the White House." The first Miss Rheingold was Spanish-born Jinx Falkenburg. When Nat King Cole became the first major black entertainer to host a television show, advertisers stayed away—but not Rheingold; Rheingold was the New York regional sponsor for Cole's show. 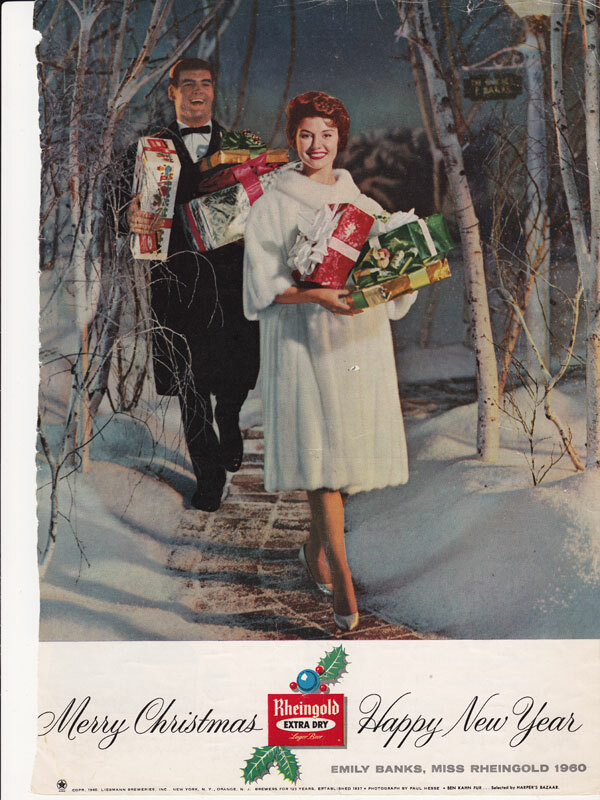 As early as 1965, Rheingold aired television ads featuring African American, Puerto Rican and Asian actors, to appeal to its racially diverse customer base. The company's headquarters was in the Bushwick section of Brooklyn. Rheingold was the official beer of the New York Mets, and its advertisements featured John Wayne, Jackie Robinson, Sarah Vaughan and the Marx Brothers. They also sponsored The Jackie Robinson Show which aired on 660 WRCA radio in New York City on Sunday evenings between 6:30 and 7 PM during the late 1950s and early 1960s. Things were indeed very different back then. Unable to compete with the large national breweries, Rheingold shut down in 1976. 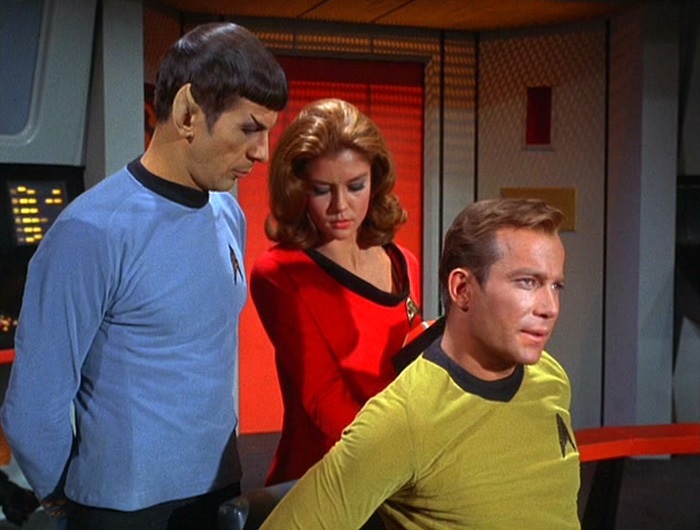 The picture shown of Emily Banks in the first post is from Star Trek Season 1, Episode 15, "Shore Leave," which first aired December 29, 1966. 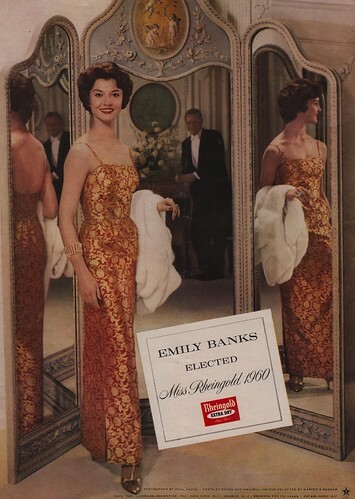 Emily went on to play minor roles on various shows through the mid-1980s. She would have got my vote. Good quiz question and detective work.